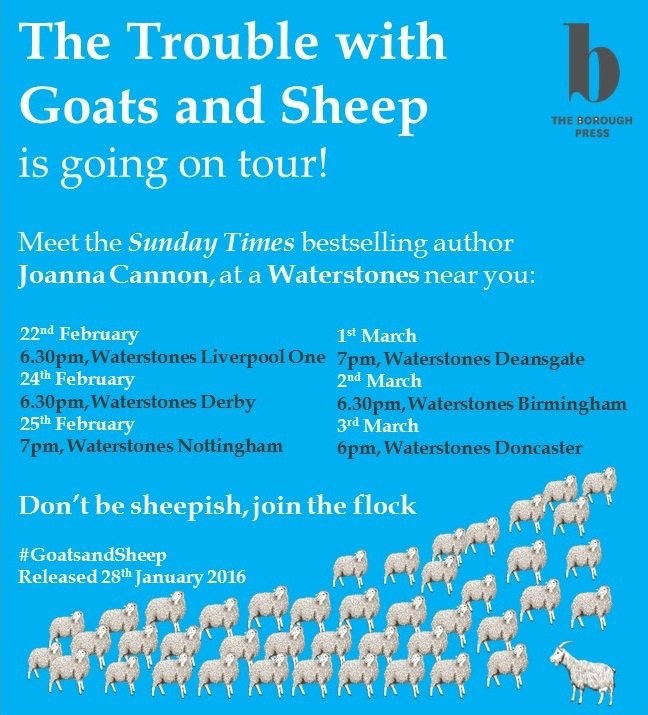 As many of you will know I am a huge, huge fan of Joanna Cannon’s debut novel The Trouble With Goats and Sheep, it is one of those books which I would called ‘required Savidge reading’, ha. 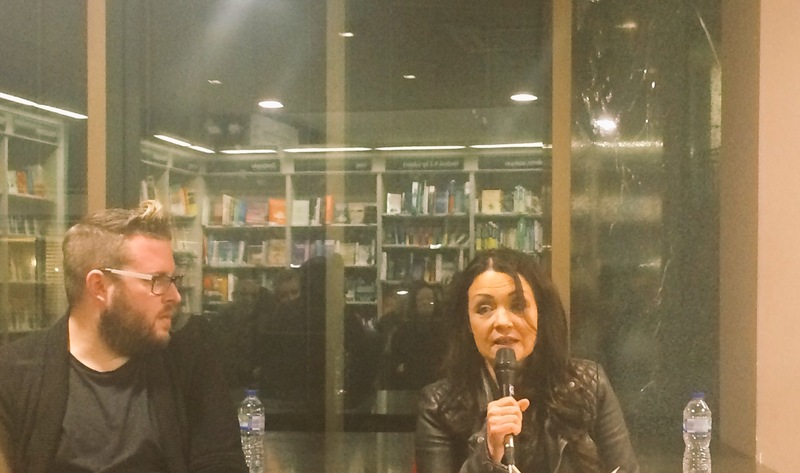 So I was delighted last night to host the first event of her book tour at Waterstones Liverpool One last night, and it was a real treat – hopefully as much for the audience as it was for Joanna and myself. 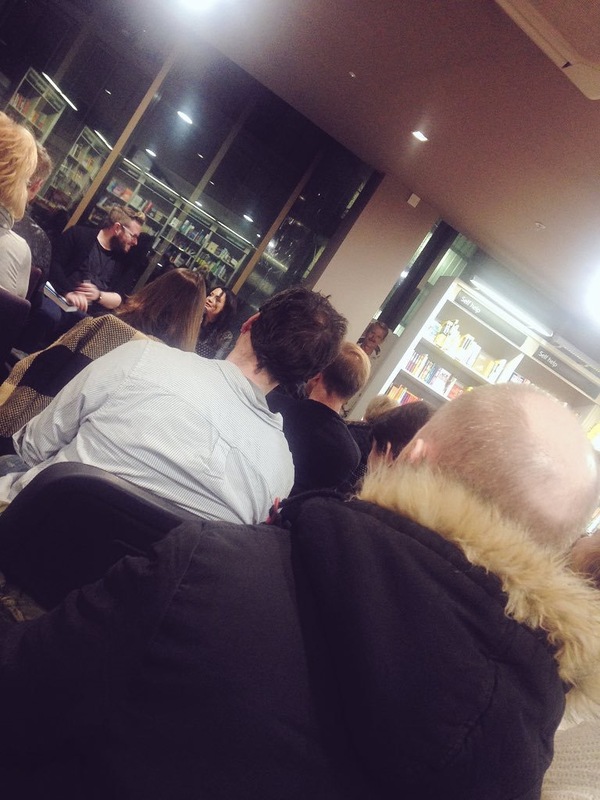 What I love about live events with authors, whether I am hosting them or not, is the fact that you can find out so much more about the book than you could ever imagine because people always have some really quirky questions. I also just love hearing from authors on how the story comes to live, not so much the writing rituals (though that can be fascinating) more the way certain little sparks can lead to a stories creation and where characters come from. I love all of this and was enthralled as Joanna read and answered my questions and even more interestingly lots from a very engaged audience. I am feeling quite spoiled as I will be chairing the Manchester event next Tuesday at Waterstones Deansgate, so get to do it all again. It would be lovely to see some of your smiling faces there. Do let me know if you can make it. If you can’t make any of these dates you can hear Joanna and I on the last episode of the second series of You Wrote The Book here. Right enough of The Trouble With Goats and Sheep for now, though I will be banging on about it a lot throughout the next year… or five, or more. Ha! No one realised then that, in many years to come, people would still speak of this summer; that every other heatwave would be compared to this one, and those who lived through it would shake their heads and smile whenever anyone complained of the temperature. It was the summer of deliverance. A summer of Space Hoppers and dancing queens, when Dolly Parton begged Jolene not to take her man, and we all stared at the surface of Mars and felt small. We had to share bath water and half-fill the kettle, and we were only allowed to flush the toilet after what Mrs Morton called a special occasion. It is the summer of 1976 and England finds itself under a sweltering heatwave with the hottest summer on record. They say that a heatwave can cause people to do strange things and it appears that on The Avenue, in the suburbs of a northern town, a strange thing has indeed happened. Beloved neighbour and friend Mrs Creasy has vanished and it seems to be the only thing that almost everyone can speak of. Why on earth would Mrs Creasy disappear? Something awful and sinister must have happened surely? Was it her husband or someone else? All eyes, including those of the police who soon investigate, fall in the direction of one particular personality in The Avenue. Mr Bishop. A man who is a little different and who people have always felt uncomfortable by, since a previous event, and so are therefore suspicious of. All that is except those of two young girls, Grace and Tilly – both aged 10, who decide that with all this summertime on their hands they really ought to go and solve the mystery of just where Mrs Creasy has gone. As they have been taught at church, God knows everything, so they decide to go to start searching each house to see if they can find him and therefore find the answer and whereabouts of their missing neighbour. ‘She does now,’ I said. Mr Creasby began on another box. With each one he was becoming more chaotic, scattering the contents at his feet and whispering an uncertain dialogue to himself. ‘He doesn’t look like a murderer,’ said Tilly. If, like me, you hear a book is a) told from the point of view of a young narrator and b) that young narrator investigates a mystery, you might be holding your hands to your face like that emoticon – I am so current – that depicts the scream. I was very, very wary it has to be said. However, I was proved wrong as I took to Grace within mere pages and loved her narrative. (You may remember this happened with the Flavia De Luce mysteries and I ruddy love those too,) True, the narrative switches here and there because no child can be everywhere no matter how hard they try, yet the novel predominantly comes from her point of view and I think Joanna Cannon has created a fantastic character and narrative voice with her. Grace is precocious, yet never annoying; she is cheeky which is downright funny. (I also loved the dynamic between her and Tilly.) She also has a habit of hearing things others wouldn’t, because people tend to forget themselves around children and either talk as if a child is stupid or open up to them thinking that it doesn’t really matter as a child won’t understand their adult woes anyway. Sometimes Grace knows exactly what they mean, and the value of what she hears, and other times she has no clue but of course we the reader do and slowly we realise just the level of secrecy that lie in wait behind those twitching curtains. We also come to learn that no matter how much everyone says they loved Mrs Creasy, and indeed she seemed to have befriended the whole of The Avenue, some are worried she might know a little too much about them and think it either dangerous or a relief that she is gone, but why? As someone who is rather nosey interested in life, I loved this. I also loved the fact that whilst there are secrets and mysteries in abounds they are all relatable ones, if morally ambiguous and like one of my favourite authors Kate Atkinson, Joanna Cannon celebrates the ordinary and day to day then makes it seem quite extraordinary and all the more intriguing. I sat back with a Liquorice Allsort. All the nations will be gathered before him, and he will separate the people from one another, as a shepherd separates the sheep from the goats. He will put the sheep on his right and the goats on his left. ‘I know,’ I said. ‘They’re everywhere.’ I offered her an Allsort, but she shook her head. This is the section in which the book not only reveals the reason for its title but also shows what the book is about on a much deeper level – people’s perceptions of right, wrong and others actions, which brings to the fore some of their prejudices much more openly. As does the heatwave in many ways, we can be at our worst or most vulnerable when we are hot and bothered. This isn’t just the situation with The Avenue and their feelings on Walter Bishop, though the almost flaming pitchfork approach is shocking (all the more because we can envisage it). It is also the case when a new Indian family move into the close, or when people judge one of the residents who is a single mother. Part of you as a reader thinks ‘oh but it was the seventies, people had gone a bit backward after the swinging sixties’ however if we look at the way that homophobic, racist and other bigoted views seem to be becoming all the more rife again it hits you with an added weight and poignancy. How much further forward have we really moved as a society in 40 years? And, as we see the prejudices that almost every house or neighbour has against another, we ponder on some of the subconscious prejudices and thoughts we have ourselves shown by a mirror (that blinds us with the sun) by Grace and Tilly’s naive, yet frank and honest, actions and observations. I thought this was wonderfully done. In fact I thought almost every element of The Trouble With Goats and Sheep was wonderfully done. My proof copy had a post-it note on almost every page where something would tickle me, move me, make me gasp with surprise or just leave me revelling in a single sentence. Yes, one of those books that completely takes you over and you find yourself saying ‘oh just one more chapter’ at 1am and then feel rather bereft after you close the final page. (As many of you will know my mother is an even more savage critic than me; she read the first paragraph and then took the book with her when she left that day, she thoroughly enjoyed and admired it and it now appears my step dad has devoured it too and loved it too. That is quite some acclaim.) 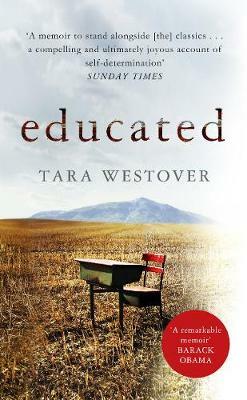 I think it really excels because it straddles, as it were, the line between an immensely readable and engaging novel with one that is also constructed of deeper layers and questions around prejudices and moral ambiguity . I could go on, but I won’t. The Trouble With Goats and Sheep is in part a whodunit, in part a coming of age story and in part a story about being a bit kinder and being open to understanding each other a little bit more. All of it is a superb read. I described it the other day as being To Kill A Mockingbird if it was set in the 1970’s in a northern English suburb with as much poignancy only a few more laughs and lashings and lashings of Angel Delight, Butterscotch of course. I really cannot say anymore than that, apart from the fact that I am thrilled it is out there in the world and you can all read it now and talk about it with me. You can probably see why it was one of my favourite books of last year and should be one of yours this year. It is a wonderful book and I am very, very, very excited to see what Joanna Cannon does next. 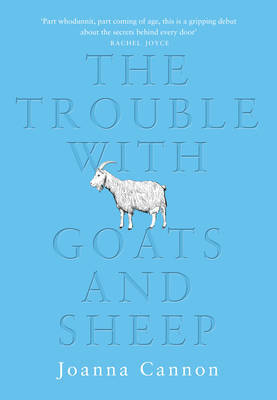 *If you would like to hear more about The Trouble With Goats and Sheep you can hear Joanna in conversation with me on the latest You Wrote the Book here. If you are in the north of England you can also come and see us chatting at Waterstones Liverpool on the 22nd of February and/or Waterstones Deansgate on March the 1st.